Election 2016: The Top Counties To Watch For Hillary Clinton, Donald Trump Want an easy way to tell who will win the election? Check out these battleground state counties that have closely reflected the statewide vote. 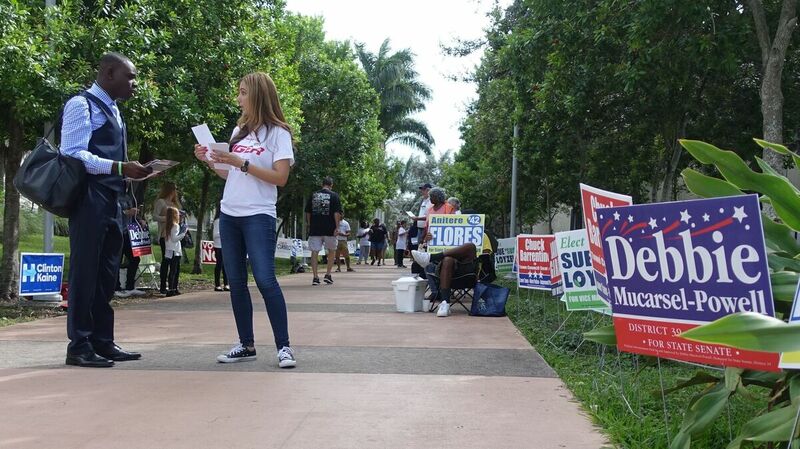 Marcela Stewart speaks to a voter at an event to encourage minority voter turnout n Cutler Bay, Fla., on Sunday. Election night is going to be information overload. We wanted to provide an easy-to-use guide of which counties to keep tabs on that could tell you how states might vote that are crucial to the election. How Does The Electoral College Work And Is It Fair? So we took 15 of the states where this election has been hotly waged and identified one county in each that has gone with the winner or closely reflected the statewide margin in each. We tried to pick counties that had a large enough population to matter some — or if they just had a knack for picking that statewide winner. This populous, longtime Republican county has shifted in the last two presidential elections, as demograpic change has swept the metro Atlanta area. It came close to reflecting the statewide vote in 2012. If it's close here, Georgia could be in play. Other counties to watch: Watch Atlanta and the suburbs. Both Clinton and Trump need to turn out their bases in Fulton (Atlanta). Democrats need to drive up the margins in Fulton and DeKalb. Trump needs to drive up the score in Cobb, which provided more votes than any other county for Mitt Romney in 2012. The Art Of The Vote: Who Designs The Ballots We Cast? This well-educated, high-income and increasingly diverse D.C. exurb (Asians and Latinos togther make up a third of this county) went for Obama twice and roughly reflected the statewide margin. Trump, who needs to pick off one Democratic leaning state, added a rally here Sunday night. Other counties to watch: Perhaps no state more starkly displays the broader rural-urban divide in this country than Virginia. The pattern has become clear between the last two presidential elections and governor's race — early results from rural counties show Republicans up, but Northern Virginia counties, especially Fairfax, have more than made up the difference. If Trump can't win back or cut into margins in places like Prince William, Fairfax and Loudon, he likely can't win the state. He would have to really drive up big margins in the less populous counties in the mountainous Western part of the state, as well as Chesterfield (south of Richmond) and Virginia Beach. We'll get an early indicator of Clinton's black support given this is a 7 p.m. poll close state and a place where 1-in-5 voters were black and went 93 percent for Obama. Watch Hampton City. In the western mountains on the border with Tennessee, it's home to Boone, which includes Appalachian State. Watauga has gone for the winner statewide in each of the last three presidential elections and three Senate races since 2008. It went for Romney in 2012 (when he won it), but Obama in 2008 (when the Democrat did). If Clinton's winning there, it means she's hitting marks with young voters. With demographic change in the Research Triangle area, though, it's possible for Clinton to win without this smaller county. Other counties to watch: Wake, in the heart of the Research Triangle, used to be considered a swing county. Not anymore. Now, Democrats have to drive up the margin in this populous, central North Carolina county. Clinton needs to be closer to Obama's 57 percent in 2008 than his 55 percent in 2012. Democrats also have to win big in Mecklenburg (Charlotte), Guilford (Greensboro), Durham and Buncombe (Asheville). Republicans also have to do drive up their own turnout in big population areas like Charlotte, but also have to drive up margins in lots of medium-size population counties like Union (Charlotte suburb). This sizable Cincinnati suburb has reflected the statewide margin in the last two presidential elections. A caveat: because its black population is higher than the state average (21 percent versus 13 percent), the county has gone narrowly for Democrats even in 2004 and 2000 when George W. Bush won the state. That might mean needing to factor that in by a couple points. Other counties to watch: Clinton has to drive up the margins in counties along the shores of Lake Erie, from Lucas (Toledo) to most notably Cuyahoga (Cleveland). There were 1.3 million voters, or a quarter of all the state's voters, in just eight counties in that stretch. She also has to run up the score in Franklin (Columbus, home to Ohio State University). Potential canaries in the coal mine, aside from Montgomery, include Wood, south of Toledo, and Stark, home to Canton and the pro-football Hall of Fame in northeastern Ohio. This Gulf Coast county is home to Tampa and has gone with the statewide winner in every presidential election since 1960. It is the only county to go twice for Bush and twice for Obama. But demographic change appears to have tipped the county slightly more in Democrats' direction. In other words, it's not whether Clinton wins Hillsborough that's important, but by how much. Obama won it with 53 percent of the vote while winning statewide by just 75,000 votes in 2012. Hillsborough made up more than half that margin — Obama won the county by 36,000 votes. Clinton has to hit that margin in this county where more than half a million people voted. Side note... Could the Florida Keys tell us who wins? No county more closely reflected Obama's wins in 2008 and 2012 than Monroe, home to Key West and the rest of the Keys. It did go for John Kerry in 2004, though, when Bush won the state, so let's see if Monroe retains its bellwether status beyond two elections... or if it was just a cheeseburger in paradise. (Sorry, not sorry.) Obama won Monroe County 49.6-49.1 in 2012 and 52-47 in 2008. Other counties to watch: Palm Beach and Miami-Dade are both places where Clinton has to drive up the score. Also key is Volusia, which represents a large county that has been close to the overall vote. It went Republican in 2012; if Clinton is doing better — or vice-versa — there compared to Obama, it could be a sign of things to come. Yes, another Hillsborough! Watch this populous county, home to Manchester. It's New Hampshire's biggest county by population. More than one-in-four votes cast for Obama and Romney in 2012 came from Hillsborough. Obama won it narrowly that year, by fewer than 3,000 votes. If Trump wants to win the state, he has to start with a win here — and make up the rest of the margin elsewhere. Other counties to watch: Remarkably, Obama won every county in this state in 2008. Traditional Republican eastern counties of Carroll, Belknap and Rockingham, home to Portsmouth, fell back to the GOP in 2012, but not by enough for Romney, who had a home in the state, to win. Watch the Philadelphia suburbs, and that means white women. If they are tipping to Clinton, it's over. That means, watch Bucks and Northampton counties. Bucks has three times the voters than its neighboring county to the north. But Northampton went closely with the statewide margin in 2012. To flip Pennsylvania, Trump has to start in Bucks and expand in places like Northampton. Other counties to watch: Also watch Luzerne (Wilkes-Barre). It went in a big way for Trump in the primary, but Obama won it, and the margin was similar to his statewide spread. Clinton has to drive up the score in Philadelphia with its significant share of black voters. Allegheny (Pittsburgh) is also key for Democrats. Much of the rest of the state is rural and ruby red Republican. Maricopa (home to Phoenix) is the most populous county in the state by far — 60 percent of voters live here. Just how big is it? In 2012, it had nearly half a million more voters in it than every other county in the state combined. It went for Romney 54 to 44 percent, nearly reflecting the overall margin. Other counties to watch: Pima (where Tucson is). It provided the second highest vote totals of any county and a significant share for Democrats. In each of the past three presidential elections, Arizona has had four consistently Democratic counties (Apache, Coconino, Pima, Santa Cruz) and 11 Republican ones (Cochise, Gila, Graham, Greenlee, La Paz, Maricopa, Mohave, Navajo, Pinal, Yavapai and Yuma). Jeff. Co., as its sometimes referred to, has gone more closely for the statewide winner than any other big county. It's whiter and less Hispanic than the rest of the state, but it has a higher share of residents with college degrees. And this is the state with the highest share of whites with college degrees in the country. So those suburban whites are key here and might tell a story not just about who wins the state, but who wins nationally. Other counties to watch: Denver suburbs — Adams, Arapahoe, Jefferson. Combined, they had more than twice the votes of Denver proper and 30 percent of all the votes statewide. Also key is Larimer (Fort Collins). It might be actually the best bellwether in the state, as it closely mirrored the statewide vote in both 2008 and 2012, but it has fewer voters than Jefferson, which we highlighted. But both are worth watching. For Trump to win, he has to carry this populous Detroit suburb. It very closely mirrors the rest of the state demographically (with a slightly higher Asian population), but it is far more educated. The percentage of people with college degrees here is two-thirds higher than the rest of the state. It's another one of those white, college-educated areas that could prove key to this election. Other counties to watch: Often early results in Michigan will show a close race or Republicans ahead, until the Detroit area votes come in. Almost a quarter of Obama's votes in 2012 came out of Wayne County (Detroit), which is 41 percent black. Trump also needs to overperform in Macomb, another Detroit suburb, which narrowly went for Obama in 2012. Trump also needs to drive up margins in Republican-leaning Western counties like Kent (Grand Rapids) and Ottawa (on the shores of Lake Michigan). Other swing counties to watch: Monroe and Calhoun. Texas likely isn't going Democratic, so we aren't including this in one of our 13 counties since it's less likely to decide the outcome of the presidential election. The state's demographics suggest it could go blue... one day. For a minute in this campaign, it looked like it could be a fairly close race in Texas, even within 5 points. Still, the state's worth watching. To get an idea as to whether Clinton could win it, watch Tarrant County. It went with the exact margin for Romney in 2012 statewide and McCain statewide in 2008. Other counties to watch: Counties where Clinton has to drive up the score include Bexar (San Antonio), Hidalgo (McAllen) and Travis (Austin). Trump, however, needs to drive up the score in Collin (Plano). Clinton wouldn't mind having a win in Harris (Houston and its suburbs of over one million voters), Nueces (Corpus Christi) and Tarrant Ft. Worth/Arlington). For Trump to win, he needs to flip a place like Racine, which went for Obama narrowly. The Milwaukee suburb went for Obama by just 3 points in 2012, but went for George W. Bush in 2004 — when Wisconsin was the closest state of that election, though it went for Democrat John Kerry. It won't be enough for Trump; he also needs to likely win by more than Romney did in Brown (Green Bay) and drive up turn out in Waukesha, one of the reddest and most populous counties in the state. Other counties to watch: Almost half of all of Obama's votes in 2012 came from just three places – Milwaukee City, Milwaukee County and Dane (Madison, home to the University of Wisconsin). Driving up the margins in those places will be key for Clinton. This is a fairly small county, but we couldn't resist the toll of this bellwether. Home to Tipton (population 3,199), Cedar has gone with the winner of every presidential and Senate race since 1992. Seriously. That's 14 in a row. Not a bad streak. Other counties to watch: Nowhere is more important than Polk (Des Moines). This one of 99 counties made up 16 percent of Obama's total vote in 2012. Watch the margins in Story (Ames) and Scott (Davenport). Obama won both with 56 percent; if Trump is making them competitive, that could mean Iowa goes his way. This county, home to Reno, borders California and is at the opposite end of the state from Las Vegas. It has gone with the statewide winner in every presidential election since 2000. It is whiter than the rest of the state but has a slightly higher level of college degrees, although still it's just 28 percent. Other counties to watch: Clark County (Las Vegas, Henderson), Democrats have to drive up big margins in Las Vegas, something they have lots of experience doing. Three-in-four votes for President Obama in 2012 came from Clark County. Like Texas, Utah looks like it's receded from the battleground, so we don't include it in our 13 battlegrounds. But since it's gotten so much attention this cycle with the possibility that independent Evan McMullin siphons off votes from Trump, we kept it in here. If there's a place to watch in the state that could tip it toward Clinton is college towns like Ogden in Weber County, home to Weber State. If Clinton is getting in the mid-to-high 30s there, rather than the high 20s, she might have a shot at improving her statewide total enough to beat Trump and McMullin. Still, the key for Democrats is Salt Lake, which gave Obama more than half his statewide vote there. Key Counties: The race here is not binary, so watching the margins in the biggest counties will be important. It all starts in Salt Lake, a place more liberal than you might think. Salt Lake City elected its first lesbian mayor this year, and Obama actually won Salt Lake County by a few hundred votes in 2008. If Clinton is going to win Utah, she will need to squeeze out as many Democrats as is possible in Salt Lake, and maybe win young people in those college towns, including Logan in Cache County (Utah State). The key is going to be what kind of floor McMullin has statewide and Trump's ceiling.